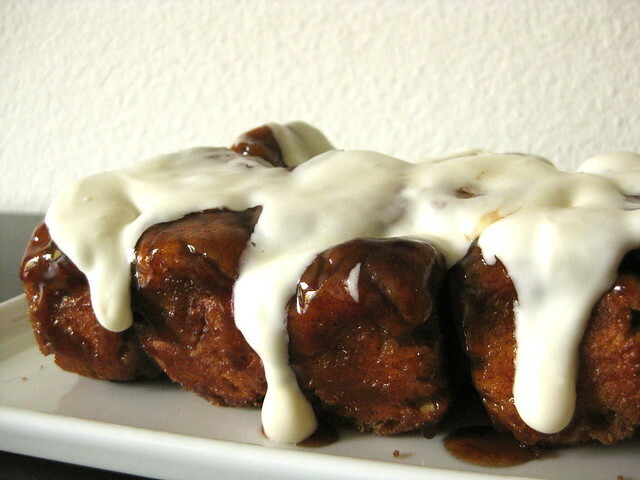 What’s not to love about puffy, pull apart dough balls enveloped in cinnamon caramel, drizzled with cream cheese icing? 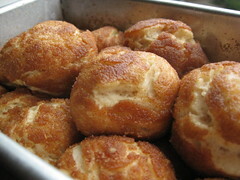 Monkey bread is all the parts of a cinnamon bun, made with a technique similar to that of Snickerdoodles. Since you don’t have to roll out and slice the dough, as with the buns, preparation is much simpler, even something you could get your kids in on. The only bad part is that the loaf always disappears too quickly, a problem easily solved by making a double batch. Grease a one-pound loaf pan with butter, set aside. In a 2 cup microwave-safe measuring cup combine butter and milk. Heat on full power for about 45 seconds, or until the milk is warm to the touch and the butter is partially melted. Stir sugar and yeast into milk mixture; allow yeast to proof slightly (about 5 minutes) while you get the dry ingredients ready. Into the bowl of a stand mixer, whisk together millet flour through salt. Fit a stand mixer with the paddle attachment and turn to low speed. With mixer running, pour milk mixture into the dry ingredients. Increase mixer to medium speed and continue to blend for 2 minutes. Turn the dough out onto a millet floured surface. Sprinkle the top with more millet flour, then pat out into a 1/2″ thick rectangle (use additional millet flour as needed to prevent it from sticking). Cut dough into 24 pieces of about equal size. Place melted butter in a small bowl (about 1 or 2 quarts) and whisk together cinnamon and brown sugar in another bowl. Coat hands lightly with a little of the melted butter to prevent the dough from sticking; roll each dough piece into a seamless ball, place in butter bowl. Toss balls, coating all sides with butter. 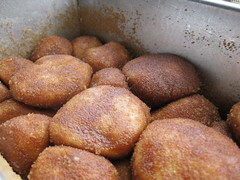 Transfer butter-coated balls to the cinnamon-sugar mixture; toss until coated on all sides. Pour balls into prepared loaf pan, cover top of the pan with plastic wrap and allow to rise in a warm, draft-free spot (a microwave is typically a good, out of the way place) to rise for an hour, or until doubled in size and just under the lip of the pan. Preheat the oven to 350°F. Bake loaf for 30 minutes, or until golden brown and slightly crisp on top, with bubbly cinnamon caramel. Remove pan to a cooling rack, allow to rest for 10-15 minutes (make cream cheese icing in the meantime, below). Once it has cooled slightly, invert onto a serving plate (it may fall apart a little bit, no big deal!). When the loaf comes out of the oven, make cream cheese icing. In a small bowl, stir together melted butter, cream cheese and vanilla extract until smooth. Stir in half and half, powdered sugar and a pinch of salt (to counter the sweetness). The icing should be a somewhat loose, pourable consistency; add more half and half if necessary. Spoon icing over inverted, still-warm bread; gently spread icing over the edges. Serve while warm (no cooler than room temperature). Bread can be stored, covered, in the refrigerator for up to 5 days (it likely won’t be around that long). Reheat portions in the microwave on half-power for about 30 seconds. OMG that looks amazing!! seriously, what is not to love! Thank you, Lacy! I kept snitching pieces off the backside of the loaf before I could take all the photos; the smell was way too tempting for me not to give in :). The next time I make this I will add the cream cheese icing. Wonderful recipe. Thanks for Sharing. Thank you for reading and commenting, Veronica! 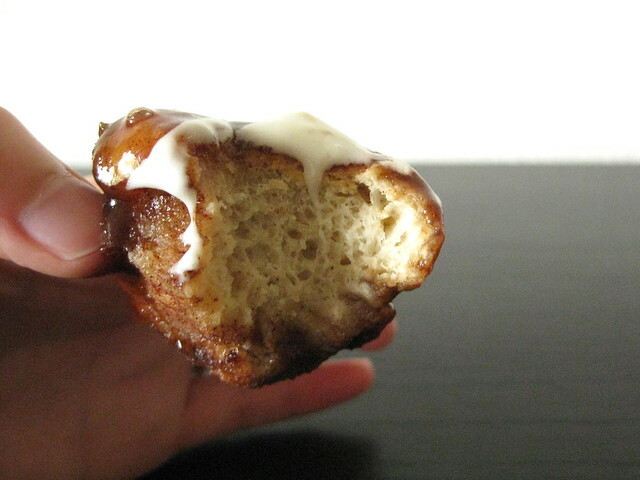 The icing does add a nice layer of tangy-sweet flavor, I highly recommend it :). 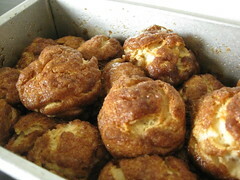 My mom used to make monkey bread, and it was awesome. Great recipe. Thanks for sharing. My kids love monkey bread because it’s so much fun to eat! I have never had monkey bread although I have seen numerous post of this wonderful bread and yours certainly looks wonderful! I need to make some. Christine: What a nice mom, it’s such a treat. Thank you! Jen: Totally agree — something about eating messy things with my hands makes me feel like a kid. S.V. : I’ve noticed that there have a lot of posts about it lately, too — I was getting way to tempted by everyone’s photos on Pinterest and finally caved. Thank you so much, I highly encourage it! 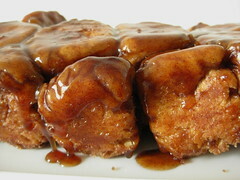 I have never had monkey bread (Non-American over here), but I’ve heard so much about it, I really want to try it. The picture sure makes it look delicious, I think I’ll succumb 😉 Thanks for sharinG! Love everything about monkey bread from the name to the sweet buttery delicious mouthfuls. We generally glaze not ice ours, but the cream cheese icing looks like so good we’ll have to go for it next time monkey bread’s on the menu. Really great to find your site with gluten free recipes. Cheryl and Adam: Thank you for stopping by and commenting. What do you use for a glaze? I’d love to give it a shot next time to compare. I find that the bit of tang from the cream cheese icing is a nice contrast to the sweetness of the cinnamon caramel. These look fabulous! I love pull apart bread which is so easy to serve!